The build-up to Conor McGregor vs Khabib Nurmagomedov was dominated by plenty of verbal sparring - and it appears the words didn't stop once the two entered the octagon on Saturday night either. McGregor suffered only the second defeat of his UFC career with the Russian extending his unbeaten record at the T-Mobile Arena in Las Vegas. Khabib dominated the contest throughout frequently taking McGregor to the mat and showing his class. The build-up saw both exchange a number of barbs between the two but McGregor appeared to attempt to play down his pre-fight trash talk during the fight. "It's only business", McGregor can be seen saying which prompted a reply of "Hey, guess so" from his opponent at the end of round three. Khabib went on to secure his victory with a rear-naked choke a round later. 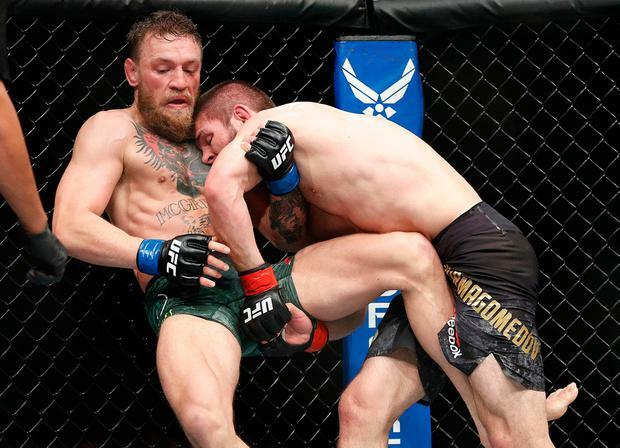 Khabib's win was immediately marred as he jumped over the cage to attack McGregor's training partner Dillon Danis, and while a melee broke out outside the octagon, three of Khabib's team jumped into it to attack McGregor – who was still recovering from being choked out. Khabib spoke at the post-fight press conference to apologise for his actions, but defended them by claiming they were a result of the provocation from McGregor, who taunted Khabib for his religion, Russian background and insulted his father. Instead, McGregor posted a message on Twitter that simply read: "Good knock. Looking forward to the rematch." "I told you guys: his whole team and him, they are tap machines. Today he tapped. Undisputed and undefeated," he said. "This is a respectful sport. This is not a trash-talking sport. I want to change this game. You cannot talk about religions and nations. This for me is very important. Thank you for waiting for me. I know my father is gonna smash me when I go home. Nevada: sorry. Vegas: sorry." However, McGregor's coach John Kavanagh, for his part, understands why Khabib did what he did.